Transparency Market Research (TMR) has published a new report titled, ‘Asthma Spacers Market - Global Industry Analysis, Size, Share, Growth, Trends, and Forecast, 2018–2026.’ According to the report, the global asthma spacers market was valued at US$ 1,330.56 Mn in 2017 and is projected to expand at a CAGR of 3.7% during forecast period from 2018 to 2026. 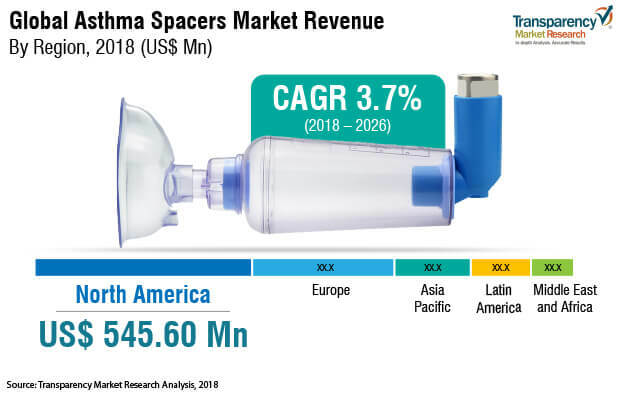 The global asthma spacers market is anticipated to be driven by technological advancements and increase in use of spacers with metered dose inhalers for the management of asthma. The asthma spacers market in Asia Pacific is expected to expand at a high CAGR of 4.2% due to high prevalence of diseases, development in the health care sector, and increase in focus on research and development. Inhalation is the first line administration route in asthma management. However, poor inhalation techniques have led to poor disease control and increased health care costs. It is estimated that MDI without spacers, at best, delivers around 20% of the emitted dose to the lower airways, leaving up to 80% in the oropharynx. With suboptimal or incorrect techniques, this fraction is further reduced, potentially to zero. While using asthma spacers, the velocity at which the medication leaves the MDI (estimated at 60mph) is slowed down substantially. It also allows the propellant to evaporate, leaving only the smaller particles, which have a better chance of reaching the smaller airways. Use of spacers/valve holding chambers minimizes issues related to the inhalation technique. It reduces oropharyngeal deposition and increases lung deposition, which, in turn, boosts the adoption of asthma spacers for the proper management of asthma. According to the WHO, around 235 million people are affected by asthma, and by the end of 2025, the number is likely to rise by 100 million globally. Rise in the prevalence rate of asthma is creating a significant socioeconomic impact across the globe, which, in turn, is propelling the demand for asthma spacers. Inhalation is the first line administration route for asthma management. Nebulizers and metered dose inhalers are widely used for the management of asthma. However, recent findings have shown that MDI with spacers is an effective alternative to nebulizers. Moreover, nebulizer therapy is expensive compared to ‘metered-dose inhaler with spacer’ and requires more equipment and maintenance to prevent contamination. It also utilizes higher doses of medications and involves more steps in drug preparation and administration. These limitations and risks associated with nebulizers have led to the wider adoption of ‘metered-dose inhalers with spacers’ for the management of asthma. Technological advancements in asthma spacers, such as cross-valve technology, have resulted in the further adoption of asthma spacers in asthma management. These factors are likely to drive the global market in the near future. In terms of product, the global asthma spacers market has been divided into aerochamber, optichamber, volumatic, inspirease, and others. The aerochamber segment is likely to account for a leading share of the global market during the forecast period, owing to the wide usage of aerochambers in asthma management. Technological developments in aerochambers are further attributed to the growth of the segment during the forecast period. Based on distribution channel, the global asthma spacers market has been segmented into retail pharmacy, hospital pharmacy, and e-commerice. The e-commerce segment is projected to expand at a high CAGR during the forecast period, owing to an increase in the number Internet users and availability of asthma spacers at a discounted price online compared to retail and hospital pharmacies. In terms of region, the global asthma spacers market has been segmented into North America, Europe, Asia Pacific, Latin America, and Middle East & Africa. North America is projected to constitute a leading share of the global market during the forecast period, owing to high adoption of asthma spacers and high health care expenditure. Europe is anticipated to account for a significant share of the global market between 2018 and 2026. Increase in the incidence of asthma, rise in awareness about the use of asthma spacers, and increase in government initiatives that mandate the use of asthma spacers with metered dose inhalers are expected to fuel the growth of the market in the region during the forecast period. The market in Asia Pacific is likely to expand at a rapid pace during the forecast period, due to a rise in health care expenditure. Moreover, increase in focus of key players on expansion in Asia Pacific, a large untapped population, and rise in awareness about asthma spacers in Asia Pacific are likely to boost the market. The asthma spacers market in Latin America and Middle East & Africa is anticipated to expand at a steady pace from 2018 to 2026. Key players profiled in this report are Koninklijke Philips N.V, Trudell Medical International, Medical Development International, Merck & Co., Pari Gmbh, AstraZeneca, and GlaxoSmithKline plc. Companies operating in the global asthma spacers market focus on strategic collaborations to develop new products in the emerging regions such as Asia Pacific and Latin America.